We are rib-lovers and we go out for bbq ribs often, but this recipe is great for when we feel like staying in. It's so easy. I usually boil mine for 45 minutes before cooking them and they come out perfect every time. They really do fall off the bone. You do have to make sure to use a really thick bbq sauce - and use enough to completely cover the ribs. 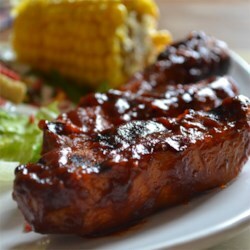 I love these ribs!! We've made them 5 times so far since finding the recipe a few months ago.